The Constitution of the United States was formed by the sanction of the States, given by each in its sovereign capacity. It adds to the stability and dignity, as well as to the authority of the Constitution, that it rests on this solid foundation. The States, then, being parties to the constitutional compact, and in their sovereign capacity, it follows of necessity that there can be no tribunal above their authority to decide, in the last resort, whether the compact made by them be violated; and, consequently, as parties to it, they must themselves decide, in the last resort, such questions as may be of sufficient magnitude to require their interposition. 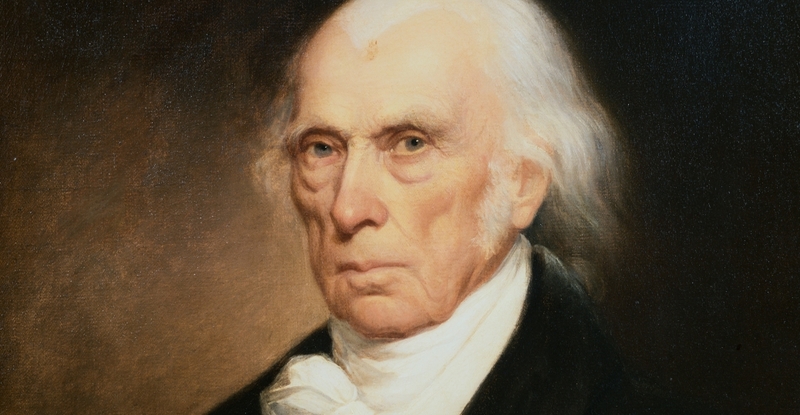 James Madison is widely considered the “father of the constitution”–in early American history, the sovereignty of the states was not a renegade view. Its relegation to the American right wing fringe was gradual, and occurred primarily because of the horrifying disasters it routinely produced. One early example was the nullification crisis of 1832, in which the state of South Carolina declared two federal tariffs null and void, and threatened to secede if the federal government attempted to force it to abide by them. The federal government’s response was two-fold–it authorized the government to use force to make South Carolina follow the law, but it also passed a new compromise tariff to appease the state. President Andrew Jackson warned South Carolina that “disunion by armed force is treason“. It might seem at first thought to be of little difference whether the present movement at the South be called “secession” or “rebellion.” The movers, however, well understand the difference. At the beginning they knew they could never raise their treason to any respectable magnitude by any name which implies violation of law. They knew their people possessed as much of moral sense, as much of devotion to law and order, and as much pride in and reverence for the history and Government of their common country as any other civilized and patriotic people. They knew they could make no advancement directly in the teeth of these strong and noble sentiments. Accordingly, they commenced by an insidious debauching of the public mind. They invented an ingenious sophism, which, if conceded, was followed by perfectly logical steps through all the incidents to the complete destruction of the Union. The sophism itself is that any State of the Union may consistently with the National Constitution, and therefore lawfully and peacefully, withdraw from the Union without the consent of the Union or of any other State. The little disguise that the supposed right is to be exercised only for just cause, themselves to be the sole judge of its justice, is too thin to merit any notice. With rebellion thus sugar coated they have been drugging the public mind of their section for more than thirty years, and until at length they have brought many good men to a willingness to take up arms against the Government the day after some assemblage of men have enacted the farcical pretense of taking their State out of the Union who could have been brought to no such thing the day before. If British and European citizens think the United States has always thought of itself as one great big happy family, they have sorely misread our history. The United States was able to fight Nazism and communism because it was big and powerful, and it was big and powerful because it was united, and it only became united because when states attempted to break up the union they were resisted, even at immense human cost. Many Europeans don’t like to think of the European Union as a United States of Europe–they like to think of it as a looser trading union, and they view attempts at further integration as Europe exceeding its mandate. But this is precisely the attitude many Americans had when, after the American Revolution, the founders attempted to throw out the weak Articles of Confederation (which did not even permit the central government to levy taxes) in favor of the much stronger federal constitution. Many founders opposed the constitution at the time for precisely these kinds of reasons. But the Articles of Confederation were simply too weak to work properly–unable to raise tax revenue or compel member states to abide by its decisions, the union created by the Articles of Confederation was a paper tiger, constantly in crisis. Today the European Union is in crisis, but it is not for the reasons Brexiteers assume. The European Union is in crisis not because of its strength, but because of its weakness. The elected European parliament is too weak, and without a strong federal government directly responsible to the people of Europe, major decisions are left to the commission, which is appointed by individual member states. This means in practice that it is the strongest member states that dominate the EU, and European politics is frequently reduced to straightforward contests of economic strength. There is no federal European state to solve the Greek debt crisis, so instead it effectively becomes a negotiation between the Greek and German governments, and Germany is too powerful to be made to concede much of anything to Greece without a federal state to keep it in line. But rather than solve these problems and create the institutions we need to have a Europe where the strong cannot exploit the weak and collective problems can be solved collectively, Brexiteers want to rip down the collective institutions we have, making it impossible for Europe to cooperate on environmental policy, worker protections, and fiscal and monetary policy. They are whipping British citizens into a nationalist frenzy with vague appeals to a sovereignty which, if exercised, can only weaken European states and reduce them to a state of competition and conflict. In America today, states’ rights are the final appeal of those who cannot otherwise defend their political views. Why shouldn’t the federal government legalize gay marriage? Why shouldn’t it raise the minimum wage? Why shouldn’t it tax and regulate carbon emissions? Why shouldn’t it prohibit slavery? When all other arguments are exhausted, opponents of essential federal action retreat to the “sovereignty” of the states. I grew up in Indiana, a state which wouldn’t even have a minimum wage law without the intervention of the federal government. I thank my lucky stars that my state isn’t “sovereign”, and the millions of people who live and work in my state are much better off because the federal system ensures we make these kinds of choices together with the rest of the country. Britain remains sovereign–its ability to make this choice about whether to remain in the EU without fear of a military confrontation with the rest of Europe makes that very clear. But what good does the sovereignty of individual European states do for the people who live and work in Europe? It is precisely because Europeans are committed to state sovereignty that they cannot create the federal institutions they need to give their people a stronger voice to make the collective decisions they need to make to solve Europe’s crises. But because Brexiteers and their Euroskeptic counterparts in other EU countries have been, as Lincoln put it, drugging the public mind for decades with simplistic and reductive stories that misattribute these problems to immigration and loss of sovereignty, it is no longer possible for politicians to have serious public debates about how to solve Europe’s problems without risking public condemnation for “forfeiting” sovereignty. So the EU becomes less transparent, and the public becomes more skeptical, and instead of having debates about how to solve our problems we collectively waste our time debating whether to stay in the EU rather than how to fix it. The EU needs its very own constitutional convention, with delegates elected directly by the people of Europe. It needs a federal state that balances the strong states against the weak ones. That federal state can use a collective fiscal policy to help struggling European states return to economic prosperity, and it can secure Europe’s borders far more effectively than the hodgepodge of national border forces upon which Europe presently relies. We’re not talking about this because we’ve all decided no one is willing to talk about it, and because of that we’re ceding the field to pessimists who want Europe to return to the bad old days of balance of power politics and interstate competition. Brexit is a 19th century solution to 21st century problems, and the fact that I have to even write pieces like this is itself reflective of how utterly reductive and debauched the public debate about the EU has become, both in the UK and throughout Europe.